Recent Arrival! Blue Metallic Buy from the First and Best Porsche dealership in Central Texas! Call Internet sales for the lowest price 844-477-6936 or see all of our inventory at www.PorscheAustin.com. Buy from the First and Best Porsche dealership in Central Texas! The best prices and biggest discounts on New Porsche! Call Internet sales for the lowest price 8 4 4 - 4 7 7 - 6 9 3 6 or see all of our inventory at www.PorscheAustin.com * While every reasonable effort is made to ensure the accuracy of this information, we are not responsible for any errors or omissions contained on these pages due to errors with our third party website provider. Recent Arrival! Cayenne Black Standard Interior in Black/Mojave Beige Trailer Hitch without Tow Ball 21" RS Spyder Design Wheels incl Wheel Arches Painted Soft Close Doors Premium Package Seat Heating (Front) Ambient Lighting Lane Change Assist (LCA) Auto-Dimming Interior Mirror Comfort Access LED Headlights incl. Porsche Dynamic Light System (PDLS) BOSE Surround Sound System Power Steering Plus Panoramic Roof System Power Seats (14-way) with Memory Package Buy from the First and Best Porsche dealership in Central Texas! Call Internet sales for the lowest price 844-477-6936 or see all of our inventory at www.PorscheAustin.com. Buy from the First and Best Porsche dealership in Central Texas! The best prices and biggest discounts on New Porsche! Call Internet sales for the lowest price 8 4 4 - 4 7 7 - 6 9 3 6 or see all of our inventory at www.PorscheAustin.com * While every reasonable effort is made to ensure the accuracy of this information, we are not responsible for any errors or omissions contained on these pages due to errors with our third party website provider. Recent Arrival! Cayenne Black Standard Interior in Black Trailer Hitch without Tow Ball 21" RS Spyder Design Wheels incl Wheel Arches Painted Soft Close Doors Window Trim in High Gloss Black Premium Package Seat Heating (Front) Ambient Lighting Lane Change Assist (LCA) Auto-Dimming Interior Mirror Comfort Access LED Headlights incl. Porsche Dynamic Light System (PDLS) BOSE® Surround Sound System Power Steering Plus Panoramic Roof System Power Seats (14-way) with Memory Package Buy from the First and Best Porsche dealership in Central Texas! Call Internet sales for the lowest price 844-477-6936 or see all of our inventory at www.PorscheAustin.com. Buy from the First and Best Porsche dealership in Central Texas! The best prices and biggest discounts on New Porsche! Call Internet sales for the lowest price 8 4 4 - 4 7 7 - 6 9 3 6 or see all of our inventory at www.PorscheAustin.com * While every reasonable effort is made to ensure the accuracy of this information, we are not responsible for any errors or omissions contained on these pages due to errors with our third party website provider. Cayenne Palladium Metallic Standard Interior in Black/Mojave Beige Power Sunblind for Rear Side Windows Massage Seat (F) incl. Seat Ventilation (F) Premium Package Seat Heating (Front) Ambient Lighting Comfort Access Auto-Dimming Interior Mirror LED Headlights incl. Porsche Dynamic Light System (PDLS) Lane Change Assist (LCA) BOSE® Surround Sound System Power Seats (14-way) with Memory Package Panoramic Roof System Power Steering Plus Buy from the First and Best Porsche dealership in Central Texas! Call Internet sales for the lowest price 844-477-6936 or see all of our inventory at www.PorscheAustin.com. Buy from the First and Best Porsche dealership in Central Texas! The best prices and biggest discounts on New Porsche! Call Internet sales for the lowest price 8 4 4 - 4 7 7 - 6 9 3 6 or see all of our inventory at www.PorscheAustin.com * While every reasonable effort is made to ensure the accuracy of this information, we are not responsible for any errors or omissions contained on these pages due to errors with our third party website provider. Recent Arrival! Cayenne White Standard Interior in Slate Grey Trailer Hitch without Tow Ball Wheel Center Caps with Colored Porsche Crest 20" Cayenne Design Wheels Seat Ventilation (Front) Roof Rails in Aluminum Finish incl. Roof Transport System Tinted LED Taillights 4-Zone Climate Control Premium Package Seat Heating (Front) Ambient Lighting Comfort Access Auto-Dimming Interior Mirror LED Headlights incl. Porsche Dynamic Light System (PDLS) Lane Change Assist (LCA) BOSE® Surround Sound System Power Seats (14-way) with Memory Package Panoramic Roof System Power Steering Plus Buy from the First and Best Porsche dealership in Central Texas! Call Internet sales for the lowest price 844-477-6936 or see all of our inventory at www.PorscheAustin.com. Buy from the First and Best Porsche dealership in Central Texas! The best prices and biggest discounts on New Porsche! Call Internet sales for the lowest price 8 4 4 - 4 7 7 - 6 9 3 6 or see all of our inventory at www.PorscheAustin.com * While every reasonable effort is made to ensure the accuracy of this information, we are not responsible for any errors or omissions contained on these pages due to errors with our third party website provider. Recent Arrival! Cayenne Quartzite Grey Metallic Standard Interior in Slate Grey Trailer Hitch without Tow Ball Wheel Center Caps with Colored Porsche Crest 20" Cayenne Design Wheels Seat Ventilation (Front) Roof Rails in Aluminum Finish incl. Roof Transport System Tinted LED Taillights 4-Zone Climate Control Premium Package Seat Heating (Front) Ambient Lighting Lane Change Assist (LCA) Auto-Dimming Interior Mirror Comfort Access LED Headlights incl. Porsche Dynamic Light System (PDLS) BOSE® Surround Sound System Power Steering Plus Panoramic Roof System Power Seats (14-way) with Memory Package Buy from the First and Best Porsche dealership in Central Texas! Call Internet sales for the lowest price 844-477-6936 or see all of our inventory at www.PorscheAustin.com. 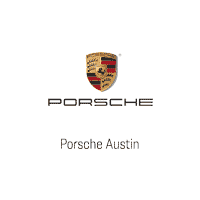 Buy from the First and Best Porsche dealership in Central Texas! The best prices and biggest discounts on New Porsche! Call Internet sales for the lowest price 8 4 4 - 4 7 7 - 6 9 3 6 or see all of our inventory at www.PorscheAustin.com * While every reasonable effort is made to ensure the accuracy of this information, we are not responsible for any errors or omissions contained on these pages due to errors with our third party website provider. Cayenne Biscay Blue Metallic Standard Interior in Black Porsche Surface Coated Brakes (PSCB) 20" Cayenne Design Wheels Sport Chrono Package Adaptive Cruise Control (ACC) Window Trim in High Gloss Black Market Introduction Vehicle Premium Package Seat Heating (Front) Ambient Lighting Comfort Access Auto-Dimming Interior Mirror LED Headlights incl. Porsche Dynamic Light System (PDLS) Lane Change Assist (LCA) BOSE® Surround Sound System Power Seats (14-way) with Memory Package Panoramic Roof System Power Steering Plus Buy from the First and Best Porsche dealership in Central Texas! Call Internet sales for the lowest price 844-477-6936 or see all of our inventory at www.PorscheAustin.com. Buy from the First and Best Porsche dealership in Central Texas! The best prices and biggest discounts on New Porsche! Call Internet sales for the lowest price 8 4 4 - 4 7 7 - 6 9 3 6 or see all of our inventory at www.PorscheAustin.com * While every reasonable effort is made to ensure the accuracy of this information, we are not responsible for any errors or omissions contained on these pages due to errors with our third party website provider. Recent Arrival! White Buy from the First and Best Porsche dealership in Central Texas! Call Internet sales for the lowest price 844-477-6936 or see all of our inventory at www.PorscheAustin.com. Buy from the First and Best Porsche dealership in Central Texas! The best prices and biggest discounts on New Porsche! Call Internet sales for the lowest price 8 4 4 - 4 7 7 - 6 9 3 6 or see all of our inventory at www.PorscheAustin.com * While every reasonable effort is made to ensure the accuracy of this information, we are not responsible for any errors or omissions contained on these pages due to errors with our third party website provider. Recent Arrival! Cayenne Rhodium Silver Metallic Standard Interior in Black Trailer Hitch without Tow Ball 22" 911 Turbo Design Wheels incl Wheel Arches Painted Door Handles in High Gloss Black Smartphone Compartment Window Trim in High Gloss Black Premium Package Plus Seat Heating (Front and Rear) Lane Change Assist (LCA) LED-Matrix Design Headlights incl. PDLS+ 4-Zone Climate Control Ambient Lighting Comfort Access Auto-Dimming Interior Mirror BOSE® Surround Sound System Seat Ventilation (Front) Power Seats (14-way) with Memory Package Panoramic Roof System Power Steering Plus Buy from the First and Best Porsche dealership in Central Texas! Call Internet sales for the lowest price 844-477-6936 or see all of our inventory at www.PorscheAustin.com. Buy from the First and Best Porsche dealership in Central Texas! The best prices and biggest discounts on New Porsche! Call Internet sales for the lowest price 8 4 4 - 4 7 7 - 6 9 3 6 or see all of our inventory at www.PorscheAustin.com * While every reasonable effort is made to ensure the accuracy of this information, we are not responsible for any errors or omissions contained on these pages due to errors with our third party website provider. Recent Arrival! Black Buy from the First and Best Porsche dealership in Central Texas! Call Internet sales for the lowest price 844-477-6936 or see all of our inventory at www.PorscheAustin.com. Buy from the First and Best Porsche dealership in Central Texas! The best prices and biggest discounts on New Porsche! Call Internet sales for the lowest price 8 4 4 - 4 7 7 - 6 9 3 6 or see all of our inventory at www.PorscheAustin.com * While every reasonable effort is made to ensure the accuracy of this information, we are not responsible for any errors or omissions contained on these pages due to errors with our third party website provider. Cayenne Biscay Blue Metallic Leather Interior in Black Rear Axle Steering incl. Power Steering Plus Adaptive Air Suspension incl. PASM Wheel Center Caps with Colored Porsche Crest PDCC Sport incl. Porsche Torque Vectoring Plus (PTV+) Stainless Steel Skid Plate (Front and Rear) Steering Wheel Heating Panoramic Roof System 19" Cayenne S Wheels Seat Heating (Front) Comfort Access Auto-Dimming Interior Mirror Lane Change Assist (LCA) LED Headlights incl. Porsche Dynamic Light System (PDLS) Sport Chrono Package i.c.w. Off-Road Package BOSE Surround Sound System Off-Road Package Power Seats (14-way) with Memory Package Ambient Lighting Power Steering Plus Amber Side Markers Buy from the First and Best Porsche dealership in Central Texas! Call Internet sales for the lowest price 844-477-6936 or see all of our inventory at www.PorscheAustin.com. Buy from the First and Best Porsche dealership in Central Texas! The best prices and biggest discounts on New Porsche! Call Internet sales for the lowest price 8 4 4 - 4 7 7 - 6 9 3 6 or see all of our inventory at www.PorscheAustin.com * While every reasonable effort is made to ensure the accuracy of this information, we are not responsible for any errors or omissions contained on these pages due to errors with our third party website provider.